As the defending world champions find themselves fighting just to return to the postseason in 2017, they will prepare for a stretch without their regular shortstop. 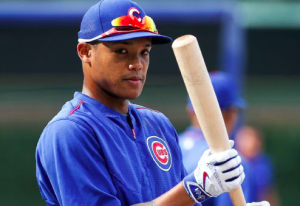 The Chicago Cubs placed shortstop Addison Russell on the 10-day DL Friday with a sprained foot. It’s the first time the 23-year old Russell has been on the DL during his big league career. The Cubs have called up pitcher Rob Zastryzny to take Russell’s spot on the active roster. Russell going on the DL explains why he was absent from Chicago’s lineup during Thursday’s loss to the Diamondbacks. The young shortstop played the full nine innings during Wednesday’s loss to the Diamondbacks, so it’s unclear when he injured the foot. Cubs manager Joe Maddon said that he only learned about the issue with Russell’s foot in the past couple of days. However, it’s possible that he’s been playing through it for a longer period of time. “We just thought it was wise to get it settled down right now, and that’s what we’re doing, and that’s it,” Maddon Friday. The manager’s comments indicate that Russell may not need to spend more than 10 days on the DL. However, depending on the severity of the foot sprain, it could take longer for the injury to heal completely. Maddon has not given any indication of a timeline for Russell’s return. The injury has come at a bad time for both Russell and the Cubs. After struggling through the first couple months of the season, Russell was much more productive in June and July. Since the all-star break, Russell is hitting .306 with an OPS of .903. He’s reasserted himself as the team’s everyday shortstop after losing playing time to Javier Baez earlier in the season. Speaking of Baez, he figures to step in as Chicago’s regular shortstop as long as Russell is on the DL. Baez has had a similar path to Russell this season. He struggled early in the year but heated up when summer arrived. He’s hitting .314 with an OPS of .991 since the all-star break. Like Russell, he’s also a strong defensive shortstop. Of course, Baez has received regular playing time at second base for much of the season. As he moves to shortstop with Russell unavailable, it leaves Ben Zobrist and Ian Happ to share duties at second base. Zobrist is a more than capable second baseman. However, he’s had a sluggish year offensively, hitting just .226 with an OPS of .687. Happ, meanwhile, is in the midst of a promising rookie year. However, there’s been a noticeable dip in his performance since the all-star break. The versatility of players like Baez, Zobrist, and Happ should allow the Cubs to cope with the loss of Russell. But with Russell starting to play well as of late, and the Cubs locked in a tight race with the Brewers for NL Central supremacy, the timing of the injury is less than ideal. The Cubs began Friday with just a game and a half lead over Milwaukee. In such a tight race, every game is important, and so losing an everyday player like Russell, even for a short-term injury, could have a significant impact in the playoff race.